This article only applies to ManyCam for Windows only. Virtual Webcam and its driver are core components and a vital part of ManyCam. ManyCam’s driver creates a virtual copy of your camera and allows to use it as a video source in multiple applications simultaneously. In other words, ManyCam receives the video stream coming from the video source and is able to direct it to several applications at a time through ManyCam’s virtual webcam. 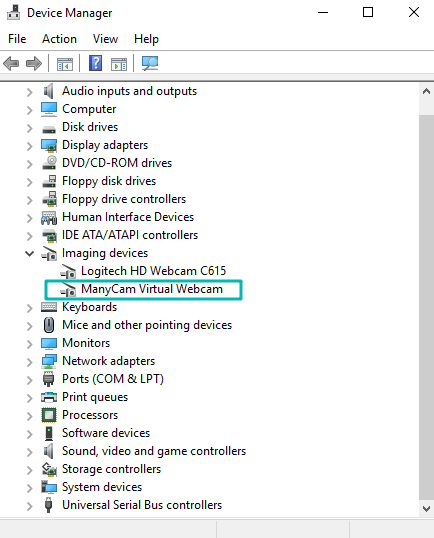 After the installation, ManyCam Virtual Webcam will be available as a webcam option like any other webcam; it’s driver is located in the Imaging devices section in your Device Manager (Device Manager → Imaging Devices → ManyCam Virtual Webcam). This is a very common error that might occur for different reasons. The very first steps to address this issue is to install all the latest Windows updates. Download and install the latest version compatible with your license or subscription. In case you have a ManyCam 5 license, it is important that you install ManyCam 5.8 from this page. ManyCam driver requires the KB3033929 update, which might be missing from your system. You can download it from Microsoft Update catalog. Please follow the link and choose proper version for your system — x86 or x64. Don’t forget to restart your machine once the update is installed. This update is not required for Windows 8.1 or Windows 10 since these systems already contain all the components necessary. Windows 10 updates may uninstall some software during minor or major updates. This is where you might get this error. Clean installation, as described above, usually resolves the issue, however, if the error still persists, please don’t hesitate to contact our Helpdesk. Don’t forget to mention in your request that you have already tried to uninstall and reinstall ManyCam after you installed all the latest Windows updates. Facebook Messenger app from Microsoft Store. We suggest the web version of this application.